When you hire someone to do a job for you, that arrangement is likely to work best if the two of you have the same goals. Or if your goals differ but are compatible, things are likely to work out pretty well, too. But if your goals are incompatible, then you’ve got a problem – a principal-agent problem. 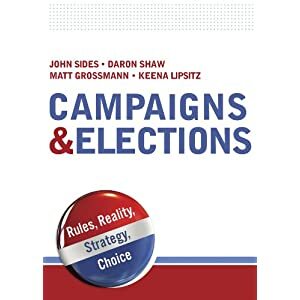 In a recent analysis (abstract only) of political campaign consulting as an industry, Matt Grossman identifies just such a situation. Consultants appear to have two sets of incentives associated with their revenue streams. First, they have a direct economic interest in having candidates spend money, especially on television [which is extremely costly]. This may come at the expense of direct mail, Internet campaigning, and GOTV drives. Second, since expenditures are likely tied to contributions, consultants also have an incentive to see that more money is raised. Rather than save money early in a campaign, consultants may be better off spending it and hoping that their candidates can raise more later. This point shouldn’t be overstated. Grossman notes that consultants have to be concerned about their reputation, and if their actions generate suspicion that they are motivated primarily by a desire to pile up huge fees for themselves, their future revenues and the viability of their firm may suffer. Still, the economic incentive structure does open a potential conflict of interest between principal and agents. Consultants are often implicated in the worst public complaints about modern campaigns. Their answer is typically to suggest that they work in their candidate’s interest, implementing what works. If business incentives create a division in client and consulting firm interests, however, we need to subject that claim to scrutiny. Political consultants are often depicted as puppet masters who deftly manipulate the strings that enable candidates to dance to a particular tune. Grossman’s research, by emphasizing the possibility that the tune may be one that suits the puppet master’s interests more than the puppet’s, amounts to a call for further research on the business side of political campaigns and the difference it makes. The contingency funding scheme — paying only if the candidate wins — probably violates campaign finance laws in most states. To be sure, there are consultants who don’t get paid because the loser’s campaign is out of money. But the contingency fee arrangement suggests a contractual obligation to pay on victory, which converts a loan into a contribution in the event of a loss. In states where there are contribution limits the in-kind contribution to a loser’s campaign by a consultant almost certainly exceed the caps. And in states where accrued expenses (i.e., outstanding bills) must be disclosed, the failure to report the market value of the service at the time it is rendered is likely a violation of disclosure laws. And if it is a loan, this must also be reported in most states. So apart from the economic risk of losing money invested in a campaign by a consultant, I don’t see how this is sustainable as a matter of law. I hadn’t thought of that, Joe…interesting tack. My first thought was that perhaps a contract could settle questions of loan vs. contingent payment. I’m not sure they could, but they might. Another wrinkle that your point brings up is that a lot of people who don’t draw their normal paychecks from campaign firms can ostensibly “volunteer” with the understanding that they be paid if circumstances permit, often at a rate for the rest of the campaign to make up for no pay for a few months. Of course, there’s another response to Matt’s work, which is “so what?” (and I mean this in a nice way, honest!) That is, why should we care if there is a principal-agent problem in this relationship? From some perspectives, it would be bad because it makes campaigning less efficient, thus candidates must raise more money for the same effect. From another perspective, though, one wonders if this doesn’t encourage some kind of political darwinism, where candidates who can’t overcome this problem don’t win. (One could even go so far as to posit this as one factor in the incumbency advantage) I guess the upshot is that what you take away from this argument might depend on what you envision the ideal campaign spending to be and why. Maybe I am ignorant of most campaign finance rules, but most caps seem to be on how much a candidate can raise from individuals/entities, but not how much they can spend. So I don’t think the win-bonuses (except in publically financed states) are troublesome. Also, I think a distinction needs to be made between campaign staff and consultants. Win bonuses are not a rare thing in campaigns, but I believe these are predominantly distributed to campaign staff. Meanwhile the consultants are usually contracted month to month or for the services they provide. In high profile races, the consultant and campaign staff line may blur more. But in more local races, the direct mail guy and the staff are separate. Therefore the staffer has the incentive to regulate how much the consultant is paid with his objective of winning, and the consultant spending early problem is somewhat avoided. @Matt Jarvis: I think the principal-agent framing is wrong, too. Candidates and consultants are embedded within their respective party networks. Consultants are the party infrastructure, with institutional memory and a ready apparatus to wage campaigns. They generally don’t work for “nobody that nobody sent.” Candidates who have a chance to win tend to choose consultants who value their reputations. These also tend to be consultants with experience in the type of race at hand. Principal-agent doesn’t describe these relationships.